Declines in LNG imports in these countries were partially offset by increasing LNG imports elsewhere in Asia. Imports in India and Taiwan, the fourth- and fifth-largest LNG importers, respectively, increased slightly in 2015. However, most of the increase in LNG imports came from emerging Asian LNG markets, such as Malaysia, Singapore, Thailand, and Pakistan. Although LNG demand growth prospects are limited in the more mature markets of Japan and South Korea, LNG demand in China, India, Taiwan, and emerging Asian markets is expected to grow in the future. In Japan, South Korea, and China, reduced demand for natural gas in the power sector, driven by slower economic growth and lower-priced competing fuels, resulted in reduced LNG consumption in 2015. Cooler-than-usual temperatures as a result of effects from El Niño also contributed to lower electricity consumption and reduced LNG imports in those countries. Potential for LNG demand growth in both Japan and South Korea may be limited. Japan's total electricity consumption has fallen for five consecutive years, and nuclear generation is gradually returning to service, likely reducing natural gas use for electricity generation. In South Korea, government policies that favor the use of coal and nuclear over natural gas for electricity generation led to a greater use of coal-fired and nuclear power plants. In China, the lower prices of competing fuels and the slowdown in the growth of the Chinese economy drove the 2015 decline in LNG imports. Natural gas use in China may increase for several reasons: the implementation of environmental policies promoting use of natural gas in the power, industrial, and transportation sectors; the availability of imported global LNG supply at relatively low prices; and growing capacity of LNG regasification. 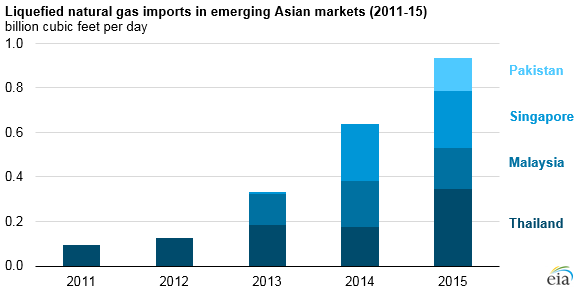 Emerging Asian LNG import markets, including Thailand, Malaysia, Singapore, and Pakistan, currently account for a small share of total Asian LNG imports, but they may have the potential to increase their LNG imports soon. LNG import growth in these countries is driven primarily by the increased use of natural gas for power generation. In Thailand, the combined effects of declining domestic natural gas production near consuming centers and strong growth in natural gas demand are driving LNG import growth. Although LNG imports provide a relatively small share of natural gas supply in Thailand, the country's LNG imports are projected to increase because of limited growth potential for domestic production and for pipeline imports from Myanmar, its two main supply sources. Malaysia began importing LNG in 2013. The country's LNG imports are projected to grow moderately, limited by competition from lower-priced coal and domestic natural gas prices. Prospects for LNG demand growth in Singapore depend on the country becoming an LNG trading hub in the region. Singapore is increasing regasification capacity and launched the SGX LNG index in an effort to establish a regional Asian LNG hub. Pakistan began importing LNG in March 2015. Pakistan's LNG imports are projected to double in the next two years. Declining domestic production and rapidly growing natural gas demand in the power generation and industrial sectors, results in increases in LNG imports.